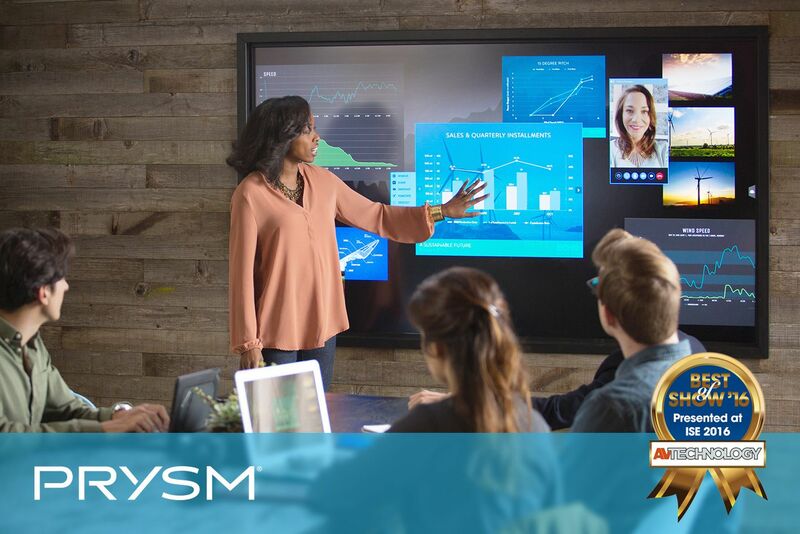 SAN JOSE, CA--(Marketwired - February 23, 2016) - Today Prysm announced that Prysm Enterprise, the newest offering in Prysm's Visual Workplace portfolio, was honored by NewBay Media's AV Technology magazine as an Integrated Systems Europe (ISE) 2016 Best of Show Award winner. With Prysm Enterprise applications, content, video conferencing and the web are all combined into cloud-based visual workspaces where anyone can create, edit, share and store work, and then go back and re-access the saved workspaces later from any location via the cloud. "Prysm's unique solution for real world use of remote and mobile collaboration makes this an outstanding system bringing disparate teams together no matter where they are located -- whether in the office, at a client site, on the road or at home," said the judges for the ISE Best of Show Award by AV Technology. "The ability to integrate all forms of video, image, and text-and share across personal and presentation worktops-streamline the business environment and delivers the ultimate in efficiency and team effectiveness." "We are seeing one of the biggest disruptions in the workplace today as AV, IT, communications and collaboration are merging into one mega visual workplace to create a more modern and productive work environment. By deploying our new Prysm Enterprise solution, enterprises can quickly experience the benefits of higher productivity and better employee engagement and retention throughout their organizations," said Paige O'Neill, CMO, Prysm, Inc. "Having Prysm Enterprise selected as an ISE Best of Show Award winner is a huge honor for us. We are very proud to be recognized as a company for pushing the innovation for the digital workplace." ISE is the largest pro-AV and systems integration trade event in Europe with more than 1,100 exhibitors and 60,000 international attendees. NewBay Media's Best of Show Awards program recognizes outstanding new products exhibited at ISE 2016. The winners were selected by panels of professional users and editors, based on information provided by the nominated companies as well as booth visits during the show. Prysm is helping companies define a new way of work. One where applications, content, video conferencing and the web can all be easily combined into a visual workspace where teams can create, edit and share. These interactive workspaces are stored in the cloud and available on any sized screen. Prysm's Visual Workplace solutions span from executive briefing center to home office -- and every size workplace in between. Today, Prysm powers 20% of the Fortune 500 and our customers are leaders in all industries including technology, energy, finance, healthcare, media and universities. To define your company's new way of work, visit prysm.com. Breakaway Communications for Prysm, Inc.
About this company Prysm Inc.